GCU’s faculty and staff are doing amazing things every day, taking on the world with a great support system behind them. One such staff member is Military Enrollment Counselor Chris Kirk, who is making the most of a helping hand from a club on campus. Kirk serves as vice president of an innovative new sports memorabilia company called The Fan Post. 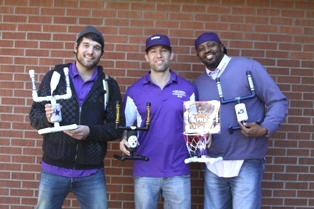 Together with founder Ken Sandy and director of media relations Brandon Hesterman, they design and sell mini football goal posts and basketball hoops, suitable for games of finger football and basketball. (l to r) Brandon Hesterman, Chris Kirk and Ken Sandy of Fan Post. The posts can be fully customized, from the color of the post and its padding to the logo and wording. Each post comes with two footballs or two basketballs, and the product runs between $30 and $50, depending on the amount of customization desired. The company has big plans. Knowing that the product would be a big seller for colleges, the team has been diligently working on getting licensing from the NCAA — a task that is both difficult and time consuming. Kirk also has been to Dallas, where he met with Gameday Merchandising, an arm of eight different professional teams, including the Phoenix Suns. Gameday has orally committed to selling The Fan Post in arena team stores as well as the online team stores of several teams. In addition, The Fan Post was chosen as an incubator project by GCU’s IDEA club, a student-based club dedicated to assisting students, faculty and staff in the creation, evaluation and implementation of ideas that provide value to others, both for profit and not for profit. IDEA is acting as a support group for The Fan Post, providing resources and ideas to help grow the company and make it successful. Kirk hopes that the company eventually will give back to GCU by providing both paid and volunteer internship opportunities for students in the Colangelo School of Sports Business. The future appears bright for the company, and the ideas are endless. For that to happen, The Fan Post will need to come up with a set of official game rules (they’re working on it, along with official game tables). Hesterman is spreading the word, getting The Fan Post involved in events, tailgates and parties, plus improving the website and using social media to gain exposure. For more information, visit www.thefanpost.com or check them out on Facebook, Twitter or YouTube.